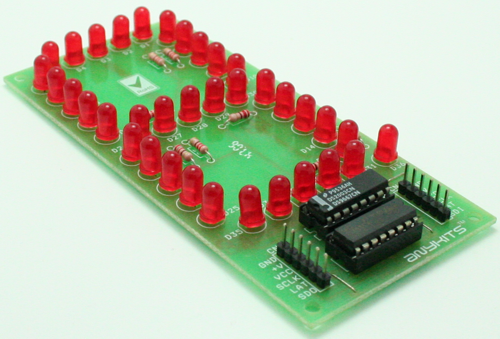 72 channels Serial (SPI) to parallel driver board has been designed for various applications. 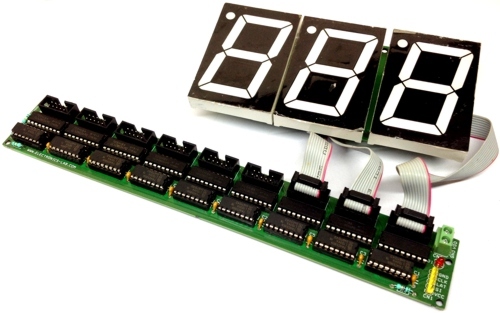 This project can be used as multi Solenoid driver, large size 7 segment display driver, bar graph driver, and LED driver. The project works with 5V logic levels. Output load supply 12V-48V DC and each output can drive 500mA load. I have used 3 digits 2.3Inch 7 segment displays as an example, this board can handle up to 9 digits. The board can serve many applications like, Stop Watch, digital timer, counter, score board, token display and lot more. 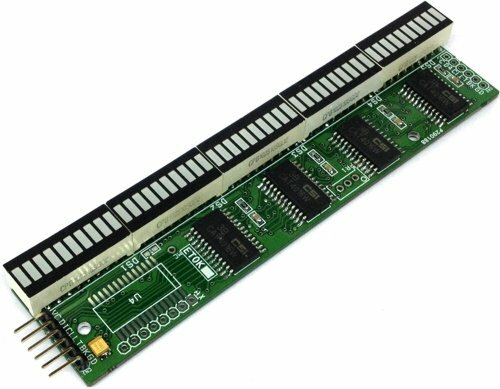 Project built around 74HC595 and ULN2803 ICs, The 74HC595 devices contain an 8-bit serial-in, parallel-out shift register that feeds an 8-bit D-type storage register. The storage register has parallel 3-state outputs. Separate clocks are provided for both the shift and storage register. The shift register has a direct overriding clear (SRCLR) input, serial (SER) input, and serial outputs for cascading. When the output-enable (OE) input is high, the outputs are in the high-impedance state. Both the shift register clock (SRCLK) and storage register clock (RCLK) are positive-edge triggered. 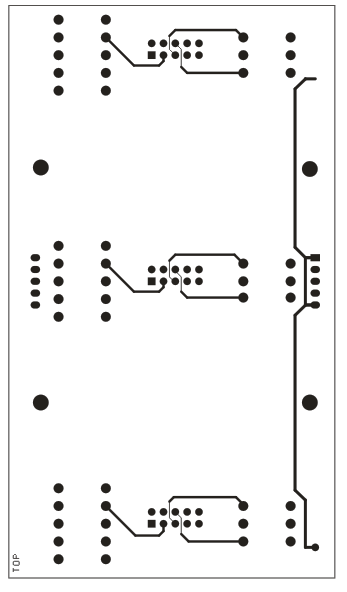 If both clocks are connected together, the shift register always is one clock pulse ahead of the storage register. 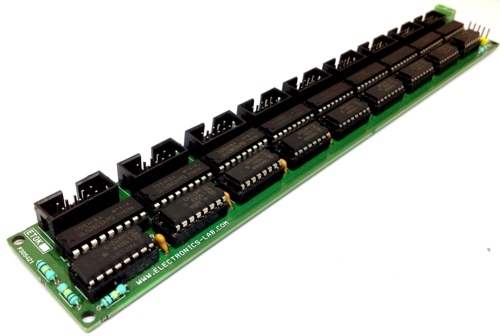 All 8 parallel output are connected to inputs of ULN2803 which is an array of 8 Darlington transistors, each transistor can sink current up to 500mA. The ULN2803A is comprised of eight high voltage, high current NPN Darlington transistor pairs. All units feature a common emitter and open collector outputs. To maximize their effectiveness, these units contain suppression diodes for inductive loads. The ULN2803A has a series base resistor to each Darlington pair, thus allowing operation directly with TTL or CMOS operating at supply voltages of 5 V or 3.3 V. The ULN2803A offers solutions to a great many interface needs, including solenoids, relays, lamps, small motors, and LEDs. Applications requiring sink currents beyond the capability of a single output may be accommodated by paralleling the outputs. 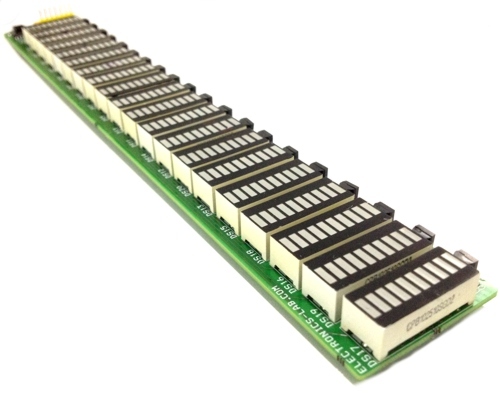 Each output directly connected to 10 Pin Box header connector including 12V supply. 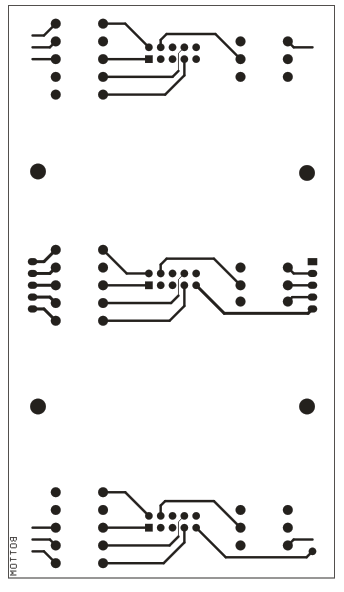 The connector helps to interface display board or any other load. 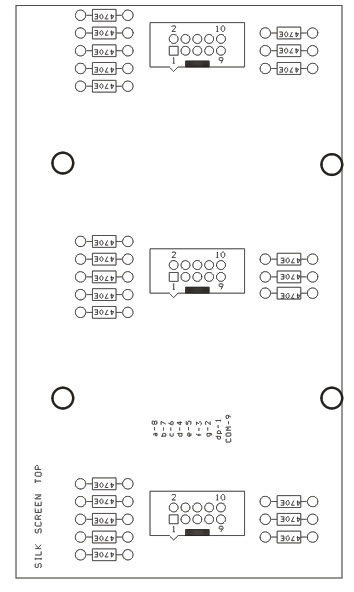 Note: 2.3Inch 7 Segment display required 470 Ohms Resister in series for 12V load supply. Unnecassary complex. There is the TPIC6B595, basically an HC595 with Open-Drain outputs. NXP and Micrel/Microchip have similar devices. Your BOM would be half the size.